Just like my last entry, this one also has a link to Long Island history. However, instead of going back to the 19th century, this one goes back about 10,000 years, to when the people who lived on Long Island hunted woolly mammoths with stone tools, like the clovis point used by this winery as its name and symbol. On a brisk but beautiful November day we continued our recovery from hurricane Sandy with a visit to this winery. When we pulled into the parking lot, we were at first a bit concerned by the presence of two large buses and a limo, but when we entered the attractive converted barn serving as a tasting room we were relieved to note that one large party was out on the lawn and another in the awninged side veranda, and there was room at the tasting bar. A band called the Earthtones was playing folk rock, a bit too loudly for our taste, but the music was pleasant, and we also enjoyed looking at the paintings of local scenes on the walls (all for sale, some at very reasonable prices). They also have cheese trays and chocolate pairings available for about $10. There are three tasting menu options, plus of course wines by the glass and bottle, which we saw several groups doing. You can have the “Cold” tasting, three whites and one rose for $8; the Reds, four reds for $10; or the Premium, also all reds, for $14. We opted for one Cold and one Premium, planning to share as usual. According to our well-informed server, all their whites tend to the light and bright side. This steel-fermented chard is light, with a lemon aroma, and a taste that reminds us of lemon candy. A bit too sweet for us, but if you like your chards on the sweet side you might like this one. It contains 1.3% Gewurtzraminer, which might account for some of the sweetness. However, this chard also has 1% Gewurtz, and yet is quite different. The aroma is somewhat like chamomile tea, and though it is also steel-fermented it is quite mellow, with some notes of honey, and nice legs. Buyable! This would be a pleasant sipping wine, and the server points out that it won a gold medal. We discuss how interesting it is that essentially the same grapes can have such different tastes. So this is their oaked chard, having spent 10 months in oak barrels. It has a somewhat off-putting smell of rotten wood, though the taste is fine. As it sits in my mouth, I taste vanilla, oak, and burnt pear. Though not unpleasant, I don’t particularly care for it. As we discuss it, the server gives us a taste of the 2009 Barrel Chardonnay for comparison. What a difference! We like this one much better, with tastes of butterscotch and refreshing citrus. This also spent 10 months in oak. Made from cabernet franc grapes which spent three days on the skins, this is a pleasant rose with tastes and aromas of watermelon and strawberry, and would make a nice summer sipping wine. I could see having it well iced with a few strawberries in it. Our server characterizes this as “European style,” and notes that it won a silver medal. The aroma is “forest,” we decide, some fruit, some oak, a bit of smoke. The taste is good, with dark cherry fruit and also a bit of smoke and oak. This, we decide, is buyable. Though primarily cab sauv, this wine also has 2% merlot and 2% cab franc, and 07 was only the second year they made it. This is also a good and buyable wine, with an aroma of cedar and berries and tastes of red plum. The tannins are soft, and it is easy to drink. I think I’d like it with duck, but not in any kind of complex sauce. Again a blend, the merlot is 85% merlot, 6.5% cab sauv, 2.5% syrah, and 1% petit verdot. This one also won a medal, this time double gold, we are told, and that it is called “select” rather than “reserve” because they are saving the term “reserve” for really exceptional wines. An aroma of smoke and coffee preceeds a somewhat odd but pleasant flavor I think tastes like lychee fruit. How did this blend of merlot, cab sauv, cab franc, petit verdot and syrah get this name? They had a contest, with the wine club members voting on the anonymously contributed names. As it happened, this was the name the owner submitted…The aroma has some of that earthy terroir, and also black fruits. The wine is fairly dry, with nice fruit and is good, but not worth the $60. However, if you join the wine club it is only $40, and at that price would be worthwhile! Reasons to visit: Pleasant tasting room with cheese trays available; good 2011 Chardonnay and 09 Barrel Chardonnay; also some good reds; art for sale; well-informed servers; nice rustic view from the veranda. Who knew that our visit to the Paumanok tasting room a day before hurricane Sandy would come to seem so prophetic, since as we arrived there I quoted the above lines from a poem by Whitman about a lovelorn seagull. He liked to use the old Native American name for Long Island, and so, apparently, does this vineyard. Paumanok had somewhat fallen off our radar because it is not included in a map of the wineries published by a wine growers association. According to our well-informed and intelligent server, some years they choose to join, and some they don’t. In any event, their Festival Red had been mentioned in an article on $20 wines by Eric Asimov, so we decided to check them out. The tasting room is a pleasant, barn-like space, with a tasting bar that could be bigger and a large patio area outside. 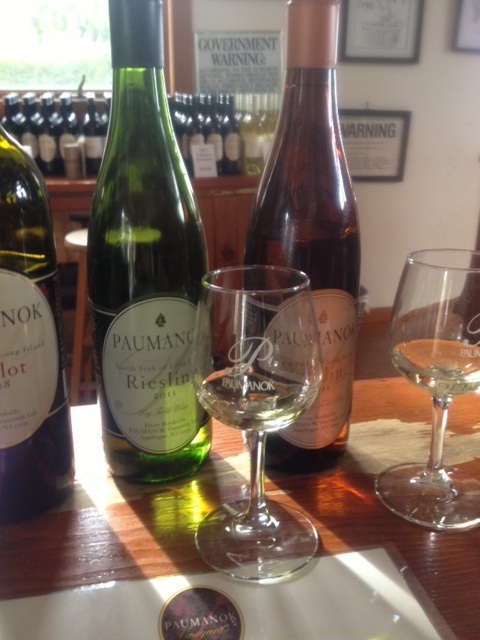 They offer four different tasting options (aside, of course, from the usual by the glass or bottle prices): Festival Flight, $8 for 4 (mixed red and white); Paumanok White, $9 for 3; Paumanok Red, $12 for 3; or Grand Vintage, $15 for 4. We opted for one Festival and one Grand Vintage flight, and our server re-arranged the order of the wines to maximize the correct tasting order. This is a light “spritzy” white, with lovely green apple or pear blossom aromas and tastes of pears and minerals. Nicely tart. Hmmm…the aroma of the semi-dry reminds us of some goldenrod honey friends of our made, and so does the taste. Pleasant, but we prefer the dry one. How interesting that the same grape can give such different results! The Dry Riesling has an aroma of lemon-lime, with lots of flavors, some flower, some gooseberry. Excellent and very buyable! They blend all four of their reds–merlot, cabernet sauvignon, cabernet franc, and petit verdot–for this pleasant rose. The aroma reminds us of wet grout (Next time you repair your bathroom tiles, see what you think of that smell. ), and there is the typical strawberry taste of a rose. This is a blend of the same four reds, and is the one mentioned in the Asimov article (as our server also points out). Well, we agree–this is a very buyable and good red, with blackberry and some spice flavor, with some tannin. It reminds us of another everyday red we like, Red Rooster from Old Field. This, clearly, is from the Grand Vintage tasting, and is very good, but not worth the price. It is a blend, with 21% petit verdot, so it is a fairly big red. Perhaps with time…? Interestingly, the aroma of this one once again reminds us of goldenrod honey. The taste, however, is of cherry, with some woody notes, and is very fresh. Our server notes that it will age well. Good. They have three different parcels of land (of about 30 acres each), so this one is named for the particular place where the vines are grown. The aroma is cherry and mineral, and the wine is dry but soft, with some lovely fruit flavors. We are informed that Robert Parker gave it a 90, and the quote from him is almost delirious. Perhaps he got a bit carried away? Not much aroma to this one, with some fruit/berry taste and some wood. Parker (according to the tasting menu) described the taste as “cherry pit” and gave it a 92. Not sure why. But wait, there’s more! Out on the patio, in the calm before the storm, they are selling platters of oysters, $20 for a dozen. So we buy two glasses of the Dry Riesling ($6 each) and pay for a plate of oysters and enjoy the late October sun on the patio as we gaze out at the vineyard. The oysters are wonderful–essence of ocean! Too good to even need a squirt of lemon, they are fresh and brimming with liquid, and come, we are told, from Peconic Bay right near Southold. The wine goes perfectly with them, and I decide this is a great way to start celebrating my birthday (which I will continue that evening with dinner at Noah’s in Greenport). Reasons to visit: Pleasant tasting room with well-informed servers (and buses and limos by appointment only); Festival Red, Dry Riesling; oysters if they have them.